Chef Charles Andres was born in the Philippines and moved to Maui, Hawaii at the age 13. In June 1995, his restaurant journey as a dishwasher began at Rusty Harpoon in Kaanapali Whalers Village. Since then, he has worked his way up in the culinary industry and has been intrigued in creating Filipino fusion dishes as observed in the kitchen of his family home. He enjoyed seeing everyone cooking together and seeing the bond between his family members got him curious and discovered his passion for cooking. After graduating High School, Charles honed his skills in Las Vegas, Nevada at the Monte Carlo Hotel and Casino, where he remained driven in pursuing a culinary career. In 2002, Charles returned back to Maui, Hawaii where he launched a career at Roy’s Restaurants that spanned 12 years and in several cities such as: Kahana, Maui, HI; La Jolla, CA; Phoenix, AZ; and Rancho Mirage, CA. Working under Roy Yamaguchi, a James Beard Award Winning Chef; Charles learned how to mesh French techniques with Asian ingredients and gained tremendous amount of experience in creating dishes that customers truly enjoy. Throughout his career, he has participated in numerous events and has been showcased in magazines, newspapers, and local news segments. 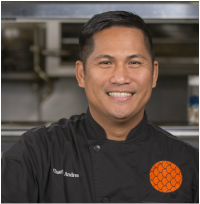 Today, as a Chef Partner of Ocean Pacific Grille located at 531 F St. San Diego, CA 92101, Chef Andres enjoys combining bold flavors of the Pacific Rim with a Filipino state of mind. His Filipino roots definitely play a big role in all the dishes he creates which can be seen in the restaurants top-selling dishes, such as Slow-Braised Short Ribs “Kare-Kare” and Crispy Skin Stealhead Trout “Sinigang.” Charles has been working diligently to get to where he is today. He acknowledges he enjoys a unique position as a Chef Partner of the only modern Filipino fusion restaurant in Downtown, San Diego and is eager to share the distinction. He is ecstatic to share in the Filipino movement and hopes to inspire other Filipino chefs out there to help promote the flavors of the Filipino culture; and for this he is excited, to be a part of Savor Filipino 2016.